The Centers for Medicare & Medicaid Services (CMS) has just released its first 2019 data on enrollment in Medicare Part D prescription drug plans (PDPs). Our exclusive analysis of these numbers finds that for 2019, 88.4% of seniors are enrolled in PDPs with preferred pharmacy networks. That’s a drop from last year's figure of 99.9%. 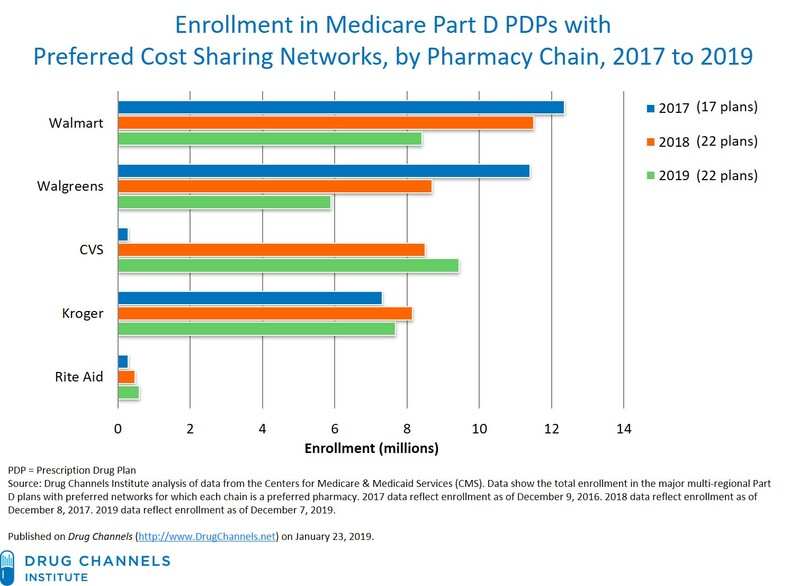 Below, we use the new enrollment data to analyze the major pharmacy chains’ position within the 22 major Part D plans that have preferred networks. As you will see, in 2019 CVS again looks poised to capture market share from Walgreens and Walmart, both of which lost position in this year’s networks. Kroger remains a major player, while Rite Aid holds a distant fourth place behind its peers. One more fun fact about 2019 enrollment: CVS Health’s SilverScript Allure, the first Part D plan with point-of-sale (POS) rebates for brand-name drugs, bombed. Was it a noble experiment or an unappealing option designed to enroll few seniors in a plan design that CVS opposes? You can find data on Prescription Drug Plan (PDP) enrollment here: Medicare Advantage/Part D Contract and Enrollment Data. These data include enrollments accepted through December 7, 2018—the date that the open enrollment ended—so they appropriately reflect 2019 trends. Last October, we documented that 92% of 2019 Medicare Part D prescription drug plans (PDP) would have preferred network structures. 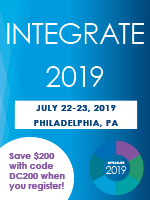 See EXCLUSIVE: Humana Triggers a Small Pullback for Preferred Pharmacy Networks in 2019 Medicare Part D. Our evaluation included only stand-alone PDPs and excluded certain other plans. See my original article for further details on the methodology. Our final sample included 81 Part D plans, operating 901 regional PDPs. For 2019, the share of PDPs with a preferred network declined to 92%, from 99% in 2018. It’s therefore no surprise that the share of PDP beneficiaries enrolled in a preferred plan also declined, from 99.9% in 2018 to 88.4% in 2019. Per our October analysis, the decline occurred primarily because two Humana plans switched from preferred to open networks for 2019. In Battle Royale: CVS and Kroger Gain, Walgreens Slips in 2019 Part D Preferred Pharmacy Networks, we examined pharmacy participation in the 24 major multi-regional Part D plans. Based on the new enrollment figures, these plans enrolled 19.5 million people, or 94% of the total beneficiaries enrolled in a stand-alone Part D plan. The 22 plans with preferred networks enrolled 17.1 million people, or 93% of those enrolled in a plan with a preferred network. We can use these data to measure the major retail chains' positions in the 2019 preferred networks. The chart below shows the total enrollment in the plans for which each chain is a preferred pharmacy. For comparison, we include data from our 2017 and 2018 analyses of enrollment. CVS pharmacy. For 2018, CVS was preferred in 11 major Part D plans. Consequently, CVS’s same-store prescription growth far exceeded that of its peers in 2018. For 2019, CVS further strengthened its position. CVS Health’s retail pharmacies are preferred in plans that enrolled 9.5 million people—more than any other retail chain. These enrollment data suggest that CVS will win additional Part D prescription market share in 2019. Walgreens. Based on the initial enrollment data, 5.9 million people signed up for the 10 plans in which Walgreens is a preferred pharmacy. This marks the chain’s second year of underperformance in preferred networks. In 2019, Walgreens will be affected most by having lost its role as a preferred pharmacy in the two Humana plans that switched to open networks. Still, Walgreens remains the only national chain in the AARP MedicareRx Walgreens plan. That plan grew its enrollment by 21%, to more than 700,000 people. Walmart. Walmart is a preferred pharmacy in 11 of the 22 major preferred cost sharing networks. Consequently, 8.4 million people are enrolled in plans with Walmart as a preferred pharmacy. That’s down from its position in 2018 preferred plans, due primarily to Humana’s switch from preferred to open networks. Walmart will also be hurt by its role as the only national chain in the Humana Walmart Rx Plan. That plan enrolled 2.1 million people—a surprising 13% drop from the 2018 figure. This is the first year that the plan’s enrollment has declined. Walmart’s weakened position makes last week’s crazy CVS network battle seem even more wrong-headed. As I quipped on Twitter: Don't bring a pharmacy to a PBM fight. Kroger. Kroger remains an active participant in the 2019 preferred networks. For 2019, Kroger will be a preferred pharmacy in 13 major national plans that enrolled 7.7 million people. Rite Aid. As usual, Rite Aid remains in the weakest position. For the fourth consecutive year, Rite Aid will not participate as a preferred pharmacy in any of the major national plans. That’s another amazing management misstep. 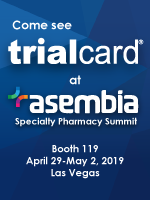 For 2019, it is again participating only in the plan sponsored by EnvisionRx, the PBM it acquired in 2015. That plan enrolled only 591,000 seniors, though enrollment grew by 26% over the 2018 figure. CVS Health’s SilverScript Allure, the first Part D plan with point-of-sale (POS) rebates for brand drugs, was a flop. It enrolled fewer than 22,000 seniors. As I wrote last October, I suspect that Allure was designed to be an intentionally unattractive plan, especially since there was no disclosure about the share of rebates being passed through. That said, CMS seems committed to changing the rebate system, so I expect other plans to offer innovative designs for 2020.